This ride starts with the bottom part of the Coromandel loop following the coast as soon as you leave our back door. Once on the Coromandel you ride over the ranges on Highway25A before turning right to take Highway 25 to Whangamata. A beautiful ride with a road that is smooth with countless corners. It gets no worse as you continue to the gold mining town of Waihi. 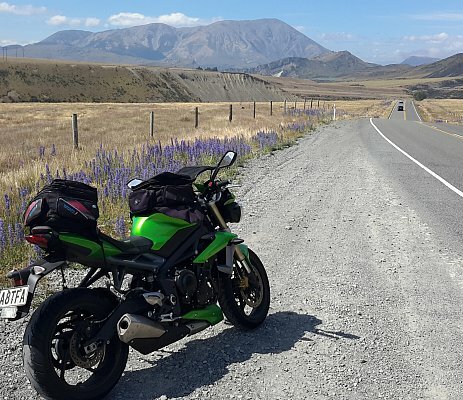 Cut through the scenic Karangaheke Gorge to Paeroa, a town world famous in NZ for its local "fizzy" drink and its February motorcycle street race. Complete the day by riding into the lovely small town of Te Aroha. Soak any aches and pains away in the historic thermal baths. Coastal scenery from Maraetai along the Firth of Thames. Great roads especially over the Coromandel Ranges, out via Whangamata and Waihi. There is plenty of time on the second day to spend the 2 hours taking in the tour of the Hobbiton movie set. Located in the prime NZ farming district with lush green rolling hills. The ride home takes you through a couple of interesting country towns. Riding time; +/- 3.5 hours.